One of the few benefits of being a long–in-the-tooth wine lover is you probably have squirreled away a few bottles over the years that are finally coming of age. Yes, it can be a sublime experience when you uncork that special wine you’ve allowed to mature for a decade or two in your cellar. Conversely, the experience can be supremely disappointing and unpleasant when the wine from that coveted bottle smells like dirty socks and tastes like spoiled buttermilk. Over the years, I have experienced both the ecstasy of sipping liquid silk, and the agony of having to discard a wine that is “over the hill.” If you would like to lay down a few bottles for future enjoyment, there are some important issues to consider. It may come as a surprise, but the vast majority of wines on the market today are meant to be consumed now, or within a couple of years. In fact, around 95 percent of all wine is ready to be consumed right off the shelf. So what wines can you safely put away for future sipping? First and foremost, you’ll want to collect wines that have the best chance of morphing into something more pleasurable as they age. That means buying red wines such as Bordeaux, California cabernet sauvignon or other sturdy reds like Chateauneuf Du Pape or Barolo and Brunello Di Montalcino from Italy. Whites such as chardonnay from Burgundy, late harvest sweet wines like Sauternes from France and riesling from Germany can also improve with age. The next important step is to determine which vintage years are touted as being the best for long-term aging. You can read periodicals such as The Wine Spectator or the Wine Advocate or go online and search for vintage rating information. Once you’ve decided on a likely age worthy vintage, read up on the specific wines and what critics are reporting about them. Oftentimes, you’ll see a lot of attention directed at the “superstar” wines such as Chateau Lafite Rothschild from Bordeaux or Opus One from Napa. But unless you’re a Russian oligarch or a dotcom billionaire, you’ll want to avoid these “trophy” wines and concentrate on ones that share the same zip code or geographic area and are more reasonably priced. Next, make sure you buy at least three bottles of a particular wine. This will allow you to open a bottle every five or so years to make sure the wine is making “forward” progress. I’ve had the unfortunate experience of finding out that I waited too long to assess the bottle, and the wine had passed its prime. Storing the wine properly is an absolutely critical issue. You don’t have to buy one of those expensive wine storage closets, but you should age the wine in a dark, vibration and odor-free area where the temperature doesn’t vary more than 10 degrees from summer to winter, and where the humidity is pretty high – around 70 percent. Get yourself one of those temperature and humidity gauges and check out your designated area to make sure it’s appropriate. If you absolutely want to be sure the storage system is ideal, you can buy temperature-controlled wine cabinets for as little as $300 or as much as several thousand. If you do the things I‘ve mentioned above, you may be able to experience in a decade or two what I had the pleasure of enjoying at Christmas dinner. 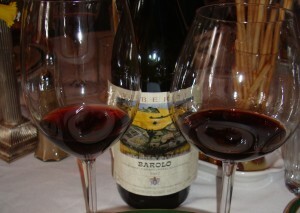 That magical night, I opened a 1997 Barolo from the Piedmont region of northern Italy to accompany the traditional bone-in rib roast. Magnificent!